Today we are featuring Bob Smith of Big Stick Archery. Find him on Instagram as @bigstickarchery. If you are a die-hard sportsman with a story to tell, tag your favorite photos with #HuntTheNation for a chance to be featured on the blog..
Tell us a little about your background. What got you into hunting? I would say I’ve been as close to growing up hunting as is possible. My grandfather began bowhunting mid-life, not too terribly long after they opened the first bow seasons in Wisconsin, and became active in a local archery club. My dad and his brothers grew up around that club and began bowhunting as soon as they came of age and it trickled down to me. My dad was working on my archery form as an infant and carrying me around in a baby carrier on scouting trips, at shoots and etc. By the time I was three I got my first “real” bow, a fiberglass Bear bow with round cams, and couldn’t pull it back but things progressed from there with 3D shoots. By the time I was twelve I had a new custom PSE Fireflight bow and shot a button buck my first season on bow hunting. As I got older I played basketball in High School, and College, and really started to pursue bass fishing. Even though I didn’t hunt nearly as much through that decade of life, my dad still did and I fit it in as much I could with my basketball schedule. What spurned your interest into traditional archery and building your own bows. Where I left off in that last question is really where I started to pursue traditional archery. Growing up around archery I was always intrigued by the guys I saw shooting traditional gear and wooden arrows. My dad still had his first bow, a Bear Kodiak Hunter that I was completely enthralled by as a young teen. I did end up getting a lighter weight recurve to shoot but never did hunt with that bow as a teen. I was starting to get more interested in fishing bass tournaments as my college days were coming to a close. I even fished a local bass tournament series around the Madison area in the family Alumacraft with an eighteen horse motor. The semester before I graduated college I figured on having a bucket load more time to pursue tournaments but a local thief had a different plan. One spring day we found that the outboards lock and been cut, the motor had been stolen, and the boat had been propped back up so we had no idea until taking a closer look. It seems crazy to think about now, but at that one point in time I choose to start shooting my dad’s old Bear recurve instead and things just snowballed from there. I had one semester left of college in Iowa, with a very light class load and focused on bowhunting Iowa with that recurve without much serious thought. I just figured it would be something really cool to do. After plenty of issues I ended up shooting a six point in Iowa that fall and a doe in the Wisconsin late season with that recurve and my fate was pretty much sealed. In my mind there was no way I was going back to shooting a compound. My venture into building bows started just as haphazardly. After buying a few custom recurves and hunting strictly with traditional gear for a few years I started researching building bows. Having always been a very “artsy” guy, I had begun building leather quivers and armguards and dreamt of taking the next step of building my own bow. Finally, I decided that with my tax refund I could either buy any custom bow I wanted, or build my own. I took the plunge and built a hot box in my basement, bought the cheapest bandsaw and belt sander I could find and laid down the money for materials for my first bow. It broke when we tried to string it. The second bow came out shootable and things have just gone from there. By the time I made my third bow it was really starting to resemble what I build now, at least a little bit. I killed a couple of turkeys and a deer with that bow, sold a few bows to local guys and things just kept rolling from that point. What is your favorite species to hunt with traditional equipment? To be honest I really can’t give you an answer. I’ve only been successful on whitetail and turkey hunts in Iowa and Wisconsin. Turkeys are DEFINITELY not my favorite species. I can stay pretty cool with bucks around but when those turkeys come in bobbing, weaving, and high strung I just can’t keep my stuff together, hardly ever. In the last four years I’ve totally taken the plunge into western, backcountry, spot and stalk style hunting. In four years I haven’t slung a single arrow but as soon as I headed out west my deer hunting back home took a back seat. Spotting velvet mule deer is awesome, bugling elk will rattle your hat off and the idea of closing in for a shot on a mountain black bear gives me the willies. I still enjoy hunting rutting whitetails but my entire year has come to evolve around my next couple western hunts. So, I guess my favorite traditional hunting is adventure hunting, where my success has been zero, but as they say, “no guts, no glory”. Growing up hunting the farmland of Minnesota, I have just started looking west myself. Up until now it’s been rifle only for me in Wyoming, making the excuse that I should get some early success with the rifle out west before I head out with archery equipment. 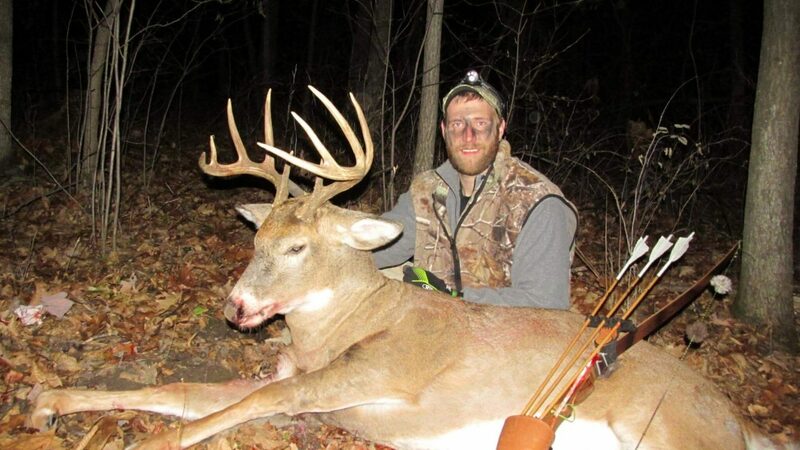 You have stayed committed from the outset with your traditional bow, even though you know the odds in getting an animal down are likely greatly reduced. That clearly shows commitment to the process itself. What’s more fulfilling, the act of building a bow, or hunting with it? 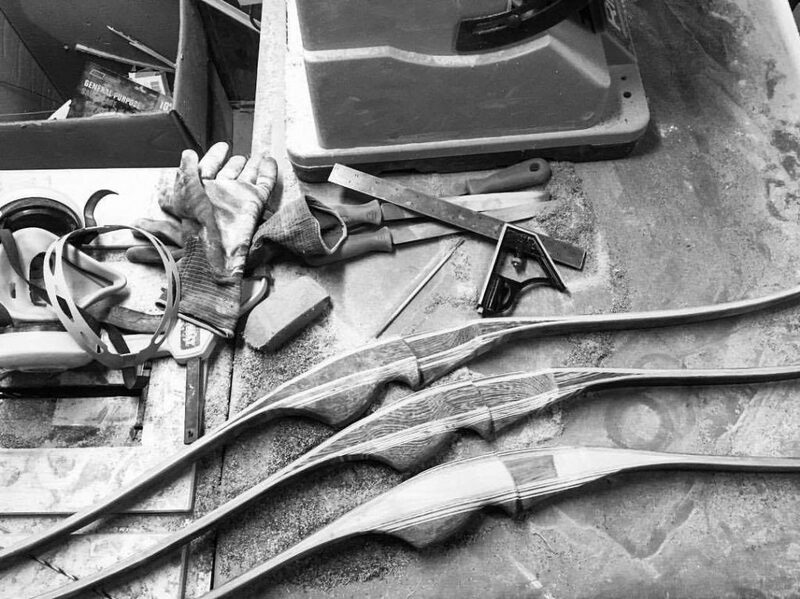 The first few years of building bows I would say I was more into “hunting with my own bows”. It felt really cool to be able to take a buck with a bow I built and some cedar arrows I’d made. After that first one, came another and another though and the novelty of that wore off quite a bit; I just expect a bow I built to do its job and worry about hunting. On that note I am finding the building bows, and the business side of things, more fulfilling. Being able to see the small details in my bows improving, getting feedback from happy customers, and seeing my business grow is pretty awesome. I’m pretty sure when I fill a couple tags out west this year though that things may shift back the other direction a bit! I have a confession to make. I shoot a recurve bow with an old school, sliding pin sight. Have I committed some kind of crime against the trad-gods by using this technology? I’m sure you wouldn’t have a problem finding guys to line up saying that you are committing a crime, but everyone has to draw a line in what they think is “trad”. Personally, I have no real interest in self bows, cane arrows, flint heads etc. I know they’re effective, but they aren’t for me. Just the other day my dad and I were discussing putting a sight on my bow. He said “Indians didn’t not have sights because they wanted to make it hard, they hadn’t invented them yet. You could have sold sights by the wagon load back then.” I thought that was pretty funny. Seriously though, after talking to some older hunters, I feel like we’ve “romanticized” what traditional archery was; those guys weren’t out to make a statement, make it hard, or look cool. They were just some guys out looking for an adventure and using what equipment was available, not really any different than today. If a person has given some thought into what they are looking to get out of archery (anything really) and makes decisions based off that, so be it. We’d all be a bit better off if we worried more about what we had going on in our own world and less about your slider sight. For a guy who wants to make the jump from a compound bow to a recurve, what are some recommendations you can give? Asides from getting a bow that is easy for you to handle and a few other essentials, there’s a lot local clubs and state “traditional bowhunter societies” that would be great to join. There’s also no shortage of information on the internet, and I would encourage a person to not try to take ALL of it so seriously, the conflicting info, and negativity on forums can really get to a guy’s head. There’s a number of guys that are putting out quality content (“the push” for example) and I would recommend picking one and really sticking to what that individual is teaching, rather than trying to mix information from twenty-two different sites all at one time. Finally, this whole thing is supposed to be fun. It takes commitment and dedication to improve; but it’s easy to get discouraged, and upset, over poor shooting etc, but it’s just archery. Try not to take it too seriously, it should never ruin your week.